Most grouse hunters are sentimentalists at heart and dream of owning a good side by side, which was the gun of choice for the old timers around the turn of the 20th century. The first half of the 1900s was truly the Golden Age for American side by sides and companies such as Parker Brothers, L.C. Smith, and A.H. Fox were producing some of the finest double guns ever made in our nation’s history. It was a time when industrial efficiency and true craftsmanship were co-equals in the shotgun industry. Around the time of World War II, Americans turned their attention to pump guns and auto-loaders and the popularity of the side by sides plummeted. In fact, most of the big-named double gun companies went under or were bought out by the big wigs such as Marlin and Remington. The Golden Age had come to an end. Fortunately for grouse hunters, many excellent quality guns were made during this time and are still available for purchase. The author’s Ithaca NID shows a beautiful patina on the receiver. When I first started grouse hunting during law school, I started with a Coast to Coast 12 gauge pump gun and looking back it was like carrying a railroad tie. Wanting more quickness, I moved on to a semi-auto Remington 11-87. With this gun I gained quickness alright, but missed so much more than I ever hit. Quite honestly, my third shot was almost always wasted. After a few years of wingshooting I began to recognize the grace of a nice double gun, but with the load of debt from school and a growing family any plans of upgrading were out of the question. In 2008 my generous brother, Shawn, gave me my first double gun, a Ruger Red Label 20 gauge over/under. I instantly loved the simplicity and beauty of this shotgun, but couldn’t shoot it well at first. With an adjustment to the stock length and lots of practice, however, I learned to be somewhat efficient with the gun and to make my shots count. Nowhere is the maxim “the grass is always greener” more true than in the quest for the right shotgun. One cannot read the literature of grouse hunting without reading many references to light side by sides that are a joy to carry in the woods. While I love my Ruger Red Label, I always dreamed of owning a classic grouse gun − a side by side − from the Golden Age of American shotguns. But with a family of six kids and two bird dogs, the possibility of acquiring such a gun seemed out of reach financially. Moreover, the quest for the perfect grouse gun for me felt like finding the proverbial needle in a haystack. I wanted to find the best possible gun for the most reasonable price. A successful shot made by the author with his Ithaca NID. What grouse hunter would not be intrigued by such a description? To me, it sounded like the absolute perfect grouse gun for hunting out west. And the price was right. I then had to convince the War Department (my better half) that the acquisition of this gun was a good investment. With her reluctant approval, I made the commitment to buy the Ithaca NID. For those who do not know, Ithaca replaced their Flues model with the NID (New Ithaca Double) in 1925 and continued to make them until 1948 when they shifted their focus to their better selling pump gun. Of the Ithaca’s side by sides, Jack O’Connor wrote in The Shotgun Book: “The Ithaca doubles were a lot of gun for the money, but in the higher grades they were neither as elegant nor as expensive as the Parkers, the Foxes, and the L.C. 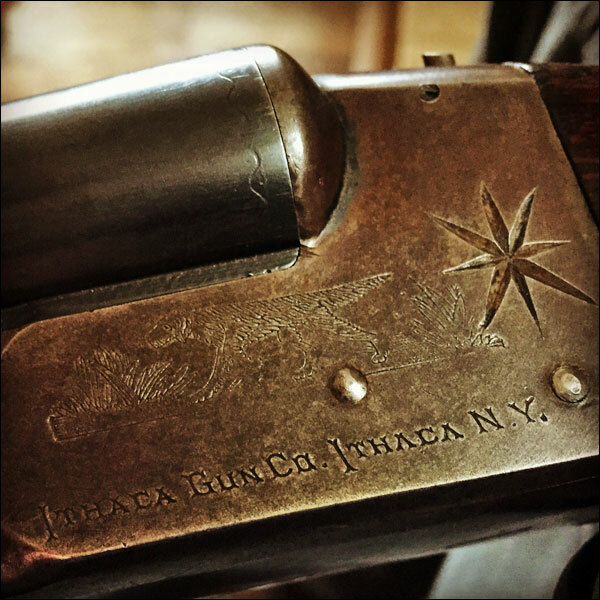 Smiths.” However, he also pointed out that “the Ithaca sold for about half what the other companies got for a corresponding grade.” So these guns were made for the working-man hunter who couldn’t afford the bigger names, which is right up my alley. The seller later informed me on the phone that the gun once belonged to an elderly grouse hunter in Maine who would be glad to know that his gun would once again be carried into the grouse woods − albeit in the Rocky Mountains. A perfect day of grouse hunting with the Ithaca NID. Shortly after purchasing the gun, I learned that many of the great hunting writers also owned and hunted with Ithacas including Elmer Keith, Gordon Macquarrie, George King (who owned a 1914 Ithaca side by side he couldn’t shoot worth a darn because of how light it was) and Michael McIntosh. In fact, McIntosh’s NID recently sold for around a whopping $19,000. My forthcoming grouse gun’s worth quickly escalated in my mind. Andrew Wayment living the dream with his Ithaca NID. After reading all of this praise for the NID, I can honestly report that I was not disappointed one bit when the gun finally arrived. In fact, it surpassed my expectations for weight, beauty and elegance. As I snapped the gun up to my cheek with my eyes closed, I was so pleased to be looking down the barrel when I opened them. The gun just fits. 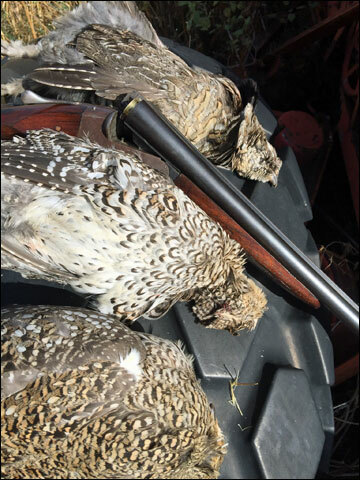 The engraving of an English Setter on the faded metal receiver was a pleasant surprise and further attested that this is indeed a grouse hunter’s gun. A few days after the gun arrived, I received a case of RST 2½-inch, low-pressure shells compliments of Brother Shawn. While trying the gun out that same day, I was tickled by how well it handled and shot where I was looking − although the double triggers will take some getting used to. Things are definitely looking up for this upcoming grouse season. 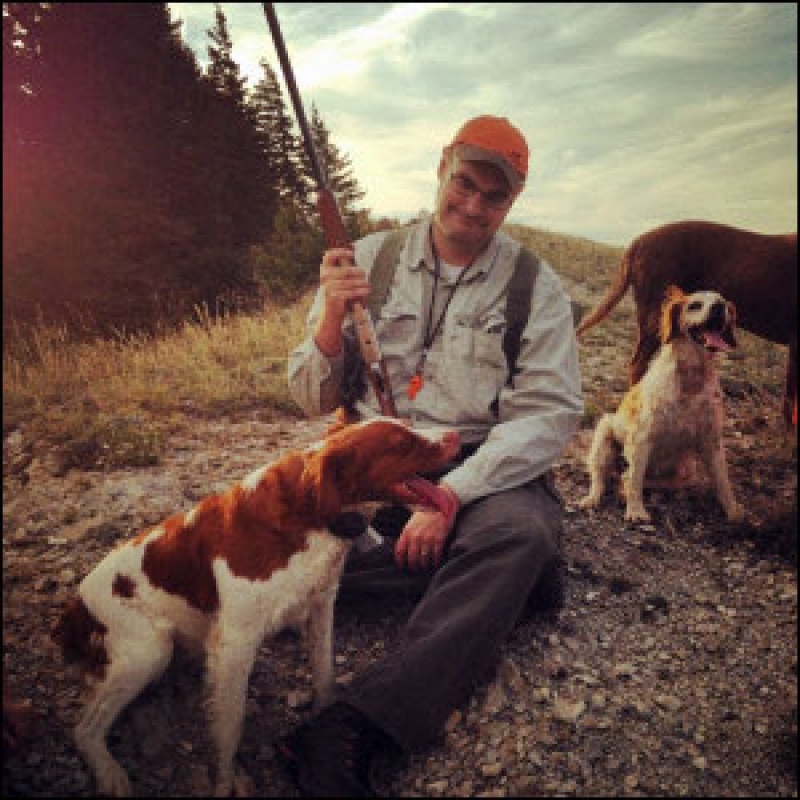 Andrew M. Wayment ("Andy") is an attorney by profession, but an outdoorsmen by passion. He lives in Idaho Falls, Idaho with his wife, Kristin, six children, and two bird dogs, Sunny, a French Brittany, and Misty, a Brittany. 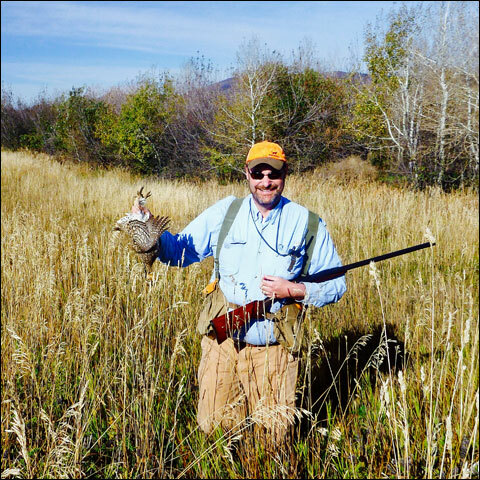 Andy not only loves to fish and hunt, but loves to write about these endeavors and has published one book and numerous articles on his adventures. Andy is also a regular contributor to the Upland Ways blog found at www.uplandways.com.